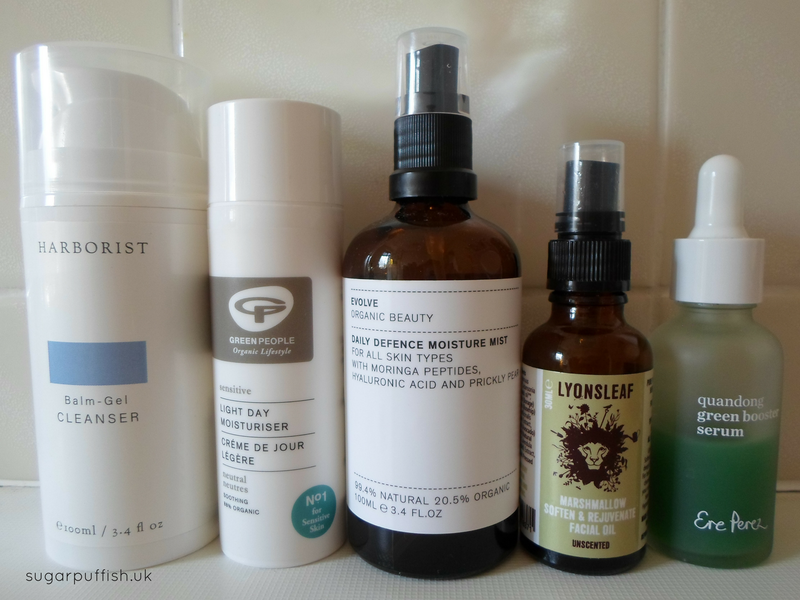 I thought I'd talk you through my current skincare routine. I think it's worth noting for any new readers that my skin is sensitive and eczema prone. Many of the products I use are free from essential oils as I need to avoid the allergen linalool. I try not to switch things around too much and only trial new products when replacing an empty one. As you can see I keep things nice and simple. I've learnt over the years that my skin becomes overwhelmed if I'm using more than a handful of products each day. Cleanser - I previously reviewed Harborist balm-gel cleanser under its old branding. I think it's the perfect cleanser for sensitive skins, a true hero in my current collection. This balm gel has a silky texture that transforms into milk when you add water. I am cleansing with this in the mornings and evenings. This has since run out and I'm now switching over to Myroo Gentle Cleanser (fragrance free) and the newly launched Bodhi & Birch Avo Bao Cleansing Balm. I've used both of them before so I know what to expect and how they work for me. Toner - I'm totally hooked on Evolve Daily Defence Moisture Mist and this is my second bottle. I didn't replace my old one straight away and slowly started to miss it from my routine. I think the addition of hyaluronic acid in this mist gives the sensation that I'm putting moisture back into my skin and prepares it for whatever I use next. Moisturiser - in the morning I use Green People Neutral Light Day Moisturiser which performs perfectly well on my dry skin. It makes for a lovely base under makeup. In the evening I mix a couple of drops of Ere Perez Quandong Green Booster Serum with a drop of Lyonsleaf Marshmallow Soften and Rejuvenate Facial Oil. Now that the weather is warming up the combination provides the hydration I need but gives a lighter feeling on the skin. You might be wondering why there are no exfoliators or face masks in my routine. The reason for this is I generally find exfoliators are not great for my skin type. There are only a couple I would use but I probably reach for them once or twice a month. The same goes for face masks. I've reviewed a few over the years and enjoyed a handful but it's not a part of my daily/weekly routine. I hope this has been helpful and gives you an insight into how I look after skin.